KEPONG sounds like a tired old place at the edge of Kuala Lumpur, which many would visit once in a while, lured by its variety of Chinese restaurants and food stalls — some which have been there for generations. But lately, property investors and new homebuyers are flocking to Kepong, especially to its old town. It has become one of the “hottest” areas for new high-rise residential developments north of Kuala Lumpur city centre. Kepong’s new property development boom was sparked by the announcement in mid-2016 of the Mass Rapid Transit (MRT) Sungai Buloh-Serdang-Putrajaya Line 2 and that seven of the 26 proposed stations along the route will be located in Kepong, namely Damansara Damai, Sri Damansara West, Sri Damansara East, Kepong Sentral, Metro Prima, Kepong Baru and Jinjang. “Other than the MRT stations, Kepong and its surrounding areas are seeing more redevelopment efforts and new infrastructure, such as the completion of several new highways and road widening projects, hypermarkets and commercial hubs,” says LandServe Sdn Bhd managing director Chen King Hoaw. “Now with Jalan Kuching and Duta-Ulu Kelang Expressway at the east, the North-South Expressway and Selayang-Kepong Highway at the west and the Damansara-Puchong Highway at the southwest, Kepong has very good connectivity by road to Kuala Lumpur city centre, Petaling Jaya and other parts of the Klang Valley,” he tells EdgeProp.my. The improved infrastructure and connectivity has encouraged a number of developers to build there. According to Metro Homes Sdn Bhd director See Kok Loong, at least eight new high-rise developments have been launched in Kepong over the past three years such as The Henge Kepong by Aset Kayamas Sdn Bhd, United Point Residence by UOA Development Bhd, LakePark Residences by JL99 Development Sdn Bhd and Fortune Centra by Asian Pac Holdings Bhd. “The new developments are mainly high-rise due to the lack of large tracts of development land available and because of Kuala Lumpur City Hall’s density policy,” notes See. He believes that the rapid development in Kepong also has to do with neighbouring state of Selangor’s foreign property ownership policy. In Selangor, foreigners are only allowed to buy above RM2 million strata properties while in Kuala Lumpur, the threshold is RM1 million. The development plot ratio in Selangor is also much lower than Kuala Lumpur’s. This has probably prompted developers to focus on developing new projects in Kuala Lumpur. “Kepong lies within Kuala Lumpur and is close to Selangor. High-end enclaves Desa ParkCity and Mont’Kiara are nearby, thus making Kepong an attractive location for both developers and homebuyers,” he highlights. Prices of new high-rise residences have been trending up. Some of the units in projects that were introduced over 2016 and 2017 were tagged as high as RM700 psf. “Condominium units at The Henge with built-ups of 1,100 sq ft to 1,300 sq ft were launched at just over RM400 psf. Subsequently, we saw serviced apartments in United Point Residence with built-ups from 667 sq ft to 1,206 sq ft being launched from RM555 psf. This was followed by East Parc @ Menjalara offering serviced apartments of 600 sq ft to 1,522 sq ft from RM708 psf. “Generally, the unit size is becoming smaller while the price psf is getting higher. Of course, there are also other factors that contribute to the developer prices,” LandServe’s Chen shares. 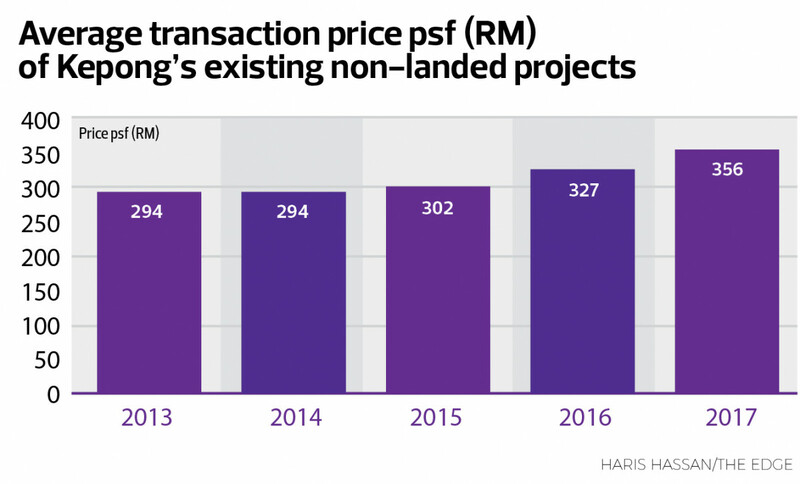 According to Yit Seng Realty team leader Alan Chin, who is a Kepong specialist, existing high-rise projects are very limited in Kepong and are usually in the price range of RM200 psf to RM300 psf while the launch prices of new units have gone up to RM750 psf to RM800 psf,” he says, adding that the new projects are definitely on the higher end and offer more lifestyle living. “There were no lifestyle elements in past high-rise projects in Kepong old town. The first lifestyle high-rise residential project launched in Kepong old town was The Henge about two years ago. It was the first residential high-rise with full-fledged condominium facilities, and such projects can only be found in the newer parts of Kepong such as Bandar Menjalara and Desa ParkCity. “The recent condominium launches were only seen from two to three years ago. However, with more than 30% average launch price growth in such a short period and during a down cycle, I think it is impressive,” adds Chin. However, Metro Homes’ See notes that prices of new property launches have stabilised, considering the current slow market especially for high-density projects. According to him, the average selling price for new high-rise homes in Kepong is about RM450 psf to RM500 psf for built-up sizes of 800 sq ft to 900 sq ft with the absolute price between RM400,000 and RM500,000. “Yes, I believe buyers can absorb new property launches at this price range and built-up sizes. However, I foresee take-up rates of new launch properties to be slow in the first half of 2018 and will only pick up in the second half,” he says. So far, new high-rise home launches in Kepong have been well received, according to Yit Seng Realty team leader Joe Kong. “From our observation, many new high-rise launches in Kepong were sold out within a year after launch. For example, the most expensive new launch, Unio Residence, KL North — with selling price as high as above RM1 million — is 90% sold with the average selling price of RM600 psf. The leftovers were all loan-rejected units. All of the big units of 1,400 sq ft were sold. The project was just launched at the end of last year,” Kong says, adding that he is confident that new projects in Kepong will continue to do well in the near future. LandServe’s Chen also expects Kepong’s overall property market outlook to be positive for both primary and secondary markets. “Generally speaking, Kepong folks have strong property buying power. The locals would have already accepted the fact that in order to own a new home within a new modern development close to the Kuala Lumpur city centre or Petaling Jaya, that would be the price they’d have to pay,” he says. After all, RM700 psf and above is quite the norm for new launches of high-rise residential developments in Kuala Lumpur and Petaling Jaya. With the proposed MRT stations in the Kepong area, Chen believes homebuyers and investors from adjoining neighbourhoods will be attracted to invest in this area. “Given time, the take-up would be good. We do not foresee any bubble,” he notes. Yit Seng’s Chin wholly agrees with Chen that Kepong’s new residential projects are well supported by local buyers. “Kepong is an old town but in the last 10 years, the younger generation in the vicinity is demanding more high-end homes. Many of them want to stay close to their parents but in a fancier home. The strong demand for modern high-rise developments with full facilities explains the strong take-up and rapid growth of new projects in Kepong,” he shares. Chin says that most of the projects have achieved 70% to 90% take-up rates, and easily 80% of the buyers are locals. Yit Seng Realty is among the appointed agents for some of these new projects. “Kepong is located 10km to 15km away from Kuala Lumpur city cente but the new project selling price psf is only half of those in the city centre and of the neighbouring Mont’Kiara. It is also a very matured area, so Kepong has all the factors to attract first-time homebuyers,” he notes. Chin and Kong both believe the market is able to take in the current selling price benchmark for high-rise residential projects in Kepong. “The take-up rate tells the truth. I think the market is comfortable with anything that is selling in between RM500 psf and RM800 psf for now. The projects won’t be selling so fast and be so well-received otherwise. I also expect the completion of MRT Line 2, which is expected to be by 2022, to boost prices further,” Kong says. As thousands of new high-rise homes are being built, is there a concern about oversupply? Kong is not worried. “What will not change is the location of Kepong. It is a very attractive and convenient area to live and stay in. The MRT Line 2 will be bringing in more traffic. I also foresee people from neighbouring areas — for example, Selayang — to move into Kepong because of the MRT,” he says. LandServe’s Chen expects the older projects and landed homes to benefit from the prices of the new projects. “Our records show that these properties have continued to enjoy steady growth in prices in recent years, with the exception of some apartments and condominiums. We expect this trend to continue. “Of course, in order for prices of stratified developments such as condominiums and apartments to go up, they must be managed and maintained properly. Otherwise, their prices can never be sustained and are destined to go down,” he concludes. Nonetheless, Metro Homes’ See is more cautious about the outlook of Kepong’s property market, especially the secondary market. “The secondary market would be slow, while for higher-end newly completed projects, prices may not appreciate much. Yield may be too low to cover loan instalments,” he offers. He adds that demand for homes on the secondary market could be affected as more new homes enter into the market over the next few years. He also foresees the rental market for these new units to be very competitive due to the large volume of new supply flowing into the market. Besides, he points out that uncertainties prevail, which may affect the general property market, such as the upcoming Malaysian general elections, the economy, the potential of another interest rate hike by the central bank and the local authority’s poor development planning and approval of more green areas for developments with high density. This story first appeared in EdgeProp.my pullout on March 30, 2018. Download EdgeProp.my pullout here for free.